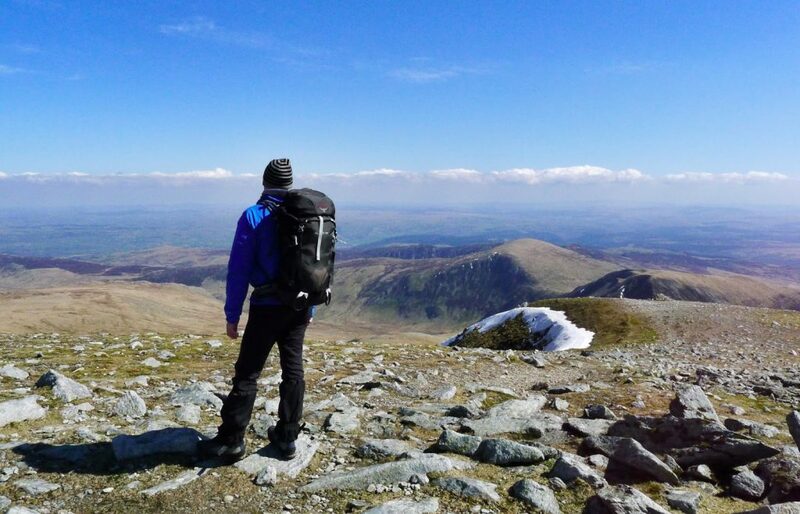 A check-up at the Royal Marsden is always a time for reflection/contemplation and with a hint of spring in the air I made a last minute decision to head up to Snowdonia. Guessing the majority of the snow would have melted from two weeks earlier I hastily grabbed some gear, chucked it in the car and headed north. Arriving in Capel Curig in the dark I ducked into Dolgam campsite, pitched the Laser and headed for a late dinner at the pub. The night was rather chilly and I woke to frost on then tent and the realisation that packing my lightweight sleeping bag was a mistake. With 300g of down the PHD Minum is a great 2-season bag but I definitely needed to wear the extra layers. A quick breakfast and I needed to plot a route. I wanted to explore the northern Carnddeau and ideally would have liked to camp on the plateau but whilst the forecast for Saturday was good, rain and wind was forecast for Sunday, so I decided that I would need to camp lower down. The twin reservoirs of Dulyn and Melyllyn were options but heading further down to Maeneira would give more shelter and a shorter walk-out in the morning. I parked by Joe Browns, succumbing to a Rab Vapour-Rise Alpine jacket I’d had my eye on for a while and grabbed some last minute provisions including a Reiter de-hydrated meal. I decided to thumb a lift down the A5, jumping out by Tryfan and heading north up to Cwm Lloer and cross the Carneddau from the south. It was a beautifully fresh day – blue sky, fluffy clouds and cool enough not to work up too much of a sweat. Turning to head up the eastern spur of Pen yr Ole Wen I found myself picking out the scrambling line before remembering that scrambling with a full-pack is not the best idea. I arrived at the summit to spectacular 360 degree views across to the Glyders and Snowdon beyond. Heading north into the col I was soon heading up to Carnedd Dafydd. The cool breeze was definitely more noticable and I sheltered behind the summit wall, grateful for a quick cuppa courtesy of the JetBoil. Looking across the ridge to Carnedd Llewelyn the last remnants of winter snow could be seen clinging to the northern reaches of the Black Ladders. It was pretty gusty heading over the col, the wind being funnelled down Cwm Llugyy and the cold beginning to find its way through my new Rab top. Heading on I was soon warmed up by the slog up the scree slope to the summit of Llewlllyn. I was following the foot-steps of a fellow back-packer and we chatted at the summit as we both pulled out the same Panasonic LX5 camera. We were both headed further north so ambled along together. Clive was of the lightweight school – I should have guessed when I noticed the lid and rear-pocket both having been surgically removed from his pack. We stopped for lunch by the bothy past Foel Grach and he pulled out various gear neatly packaged in home-made cuben fibre stuff sacks. After purchasing a cuben Laser, Clive had bought a sheet of fibre and had experimented with different shapes and jointing techniques and had fashioned bespoke sacks for his pot and caldera-cone stove. The sun was still out as we headed further north to Carnedd Uchaf and Foef-fras, with deserted rounded peaks and valleys stretching out infront of the sea. 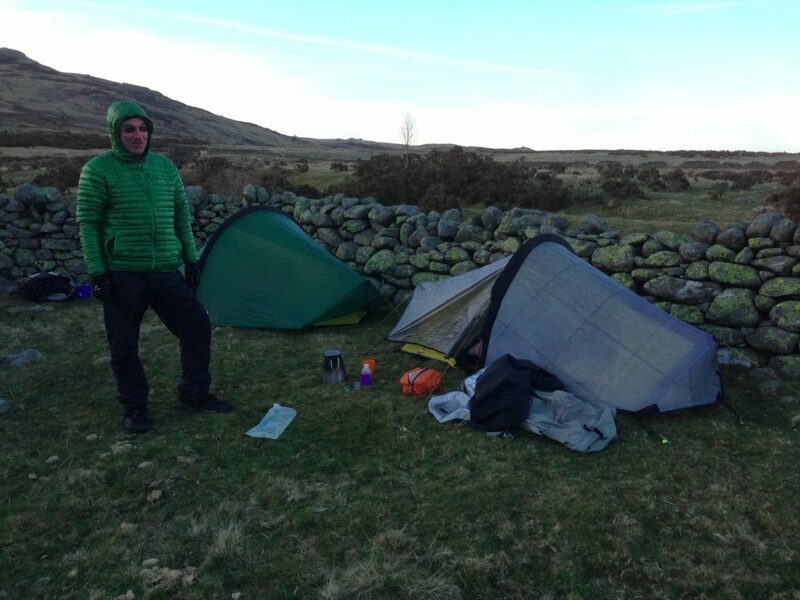 It’s a beautifully quite and remote corner of Snowdonia and I looked forward to return to camp on one of the remote summits in the near future, but now it was time to start heading down. Turning east before Drum we hogged the side of the valley and slowly dropped height toward the confluence of the water-courses by Maeneira. The sun was about to descend behind the peaks to the west as we searched for a suitably flat and sheltered spot, eventually settling by a stone wall not far from a stream. As the light faded it was 4 degrees and I knew I was in for another chilly night. I remembered my Osprey Mutant pack had a short bivvy mat inside the back so placed it under my NeoAir mattress for extra insulation. As Clive sparked up his Caldera-cone and coke-can burner I felt rather guilty (or mildy smug) as I nonchalantly lit the JetBoil and within a couple of minutes was offering him a cup of tea as waited patiently for his water to boil. He did have the last had the last laugh though as I was faced with a chemically-enhanced Reiter dehydrated meal, while he was tucking into a home-made de-hydrated three course meal! Retiring to my sleeping bag I decided to keep on my lightweight down jacket and my trousers. A toasty night was punctuated only by having to top-up my NeoAir mattress three times and a natural break made easier by the introduction to the ‘convenience’ of Pour & Store bags. Stirring at 7.30am I could hear the first drops of rain on the tent as I leaned over and ignited the JetBoil for morning brew. The breeze was up as we struck camp and within minutes the rain became stronger. The downside of my planned route was that the trek back was directly into the wind and rain and in my un-planned haste I hadn’t packed any over-trousers. For the first 20 minutes I watched the droplets bead nicely on my new softshell bottoms, but in the constant driving rain they quickly wetted-out, the water gradually dripping down inside my gaitors and into my boots. We trudged on to Llyn Eigau and then headed up and over before dropping down by the northern end of Llyn Cowllyd reservoir. The lee of a stone ruin gave some respite with the JetBoil once more demonstrating its convenience as a hot-chocolate and the last remnants of food temporarily lifted spirits. Walking down the edge of the reservoir the path was a constant torrent of water as the rain cascaded down the mountainside. 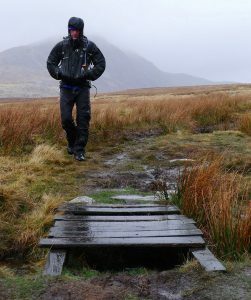 Finally we reached the head of the reservoir and were faced only with a wet and boggy trudge back down to Capel Curig. Arriving at the sanctuary of the cafe I can quite honestly say I’ve never been so thoroughly drenched! It was my first camp for a while – a few lessons learned, a few more remembered and some tips swapped with a fellow backpacker. I eventually dried out by the time I’d arrived in London after the 5 hour drive, but my boots took another 2 days. ← Previous Previous post: First Winter Climb…in April!